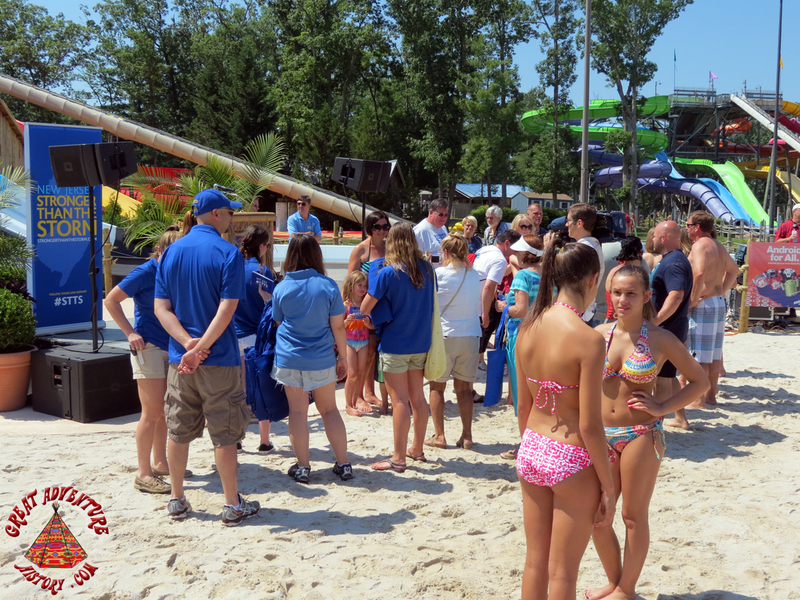 Today was a trifecta of summertime events! 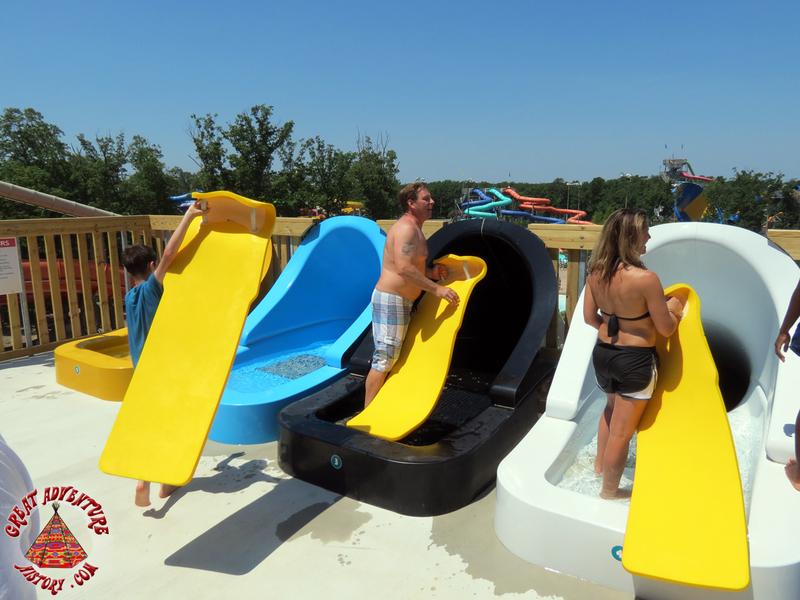 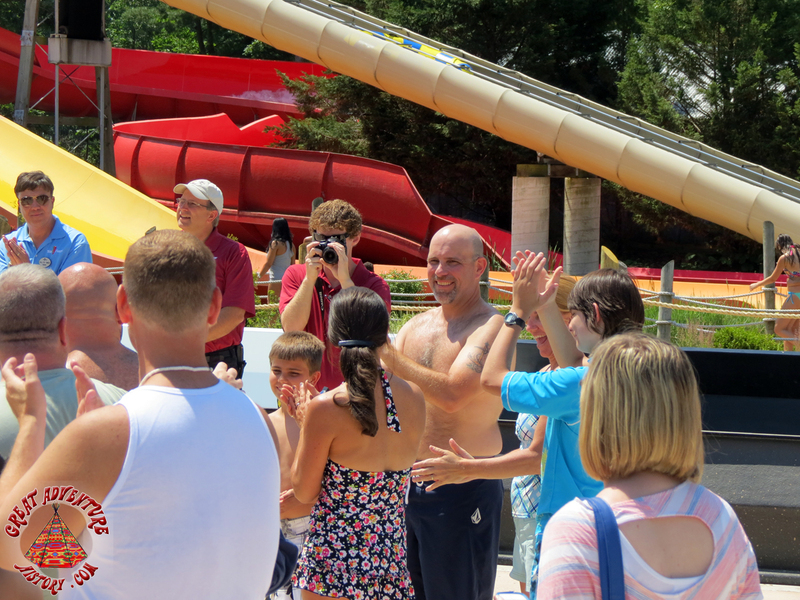 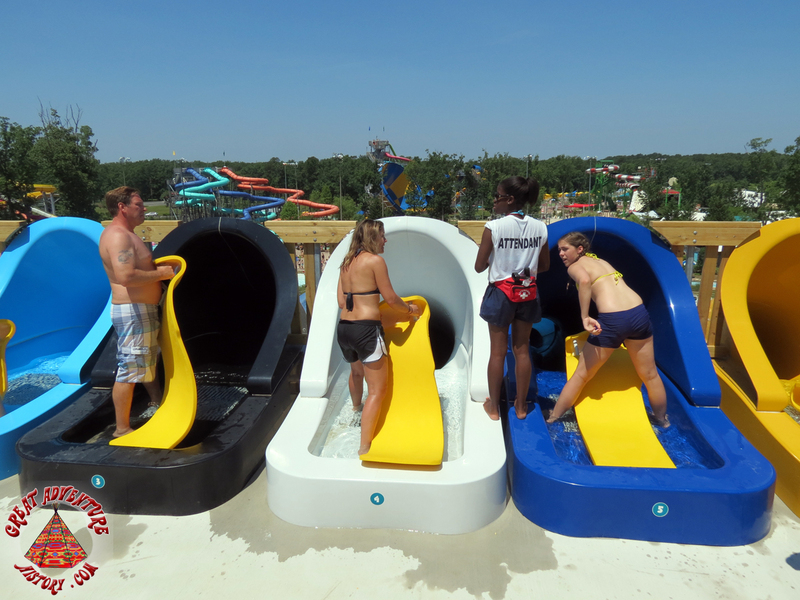 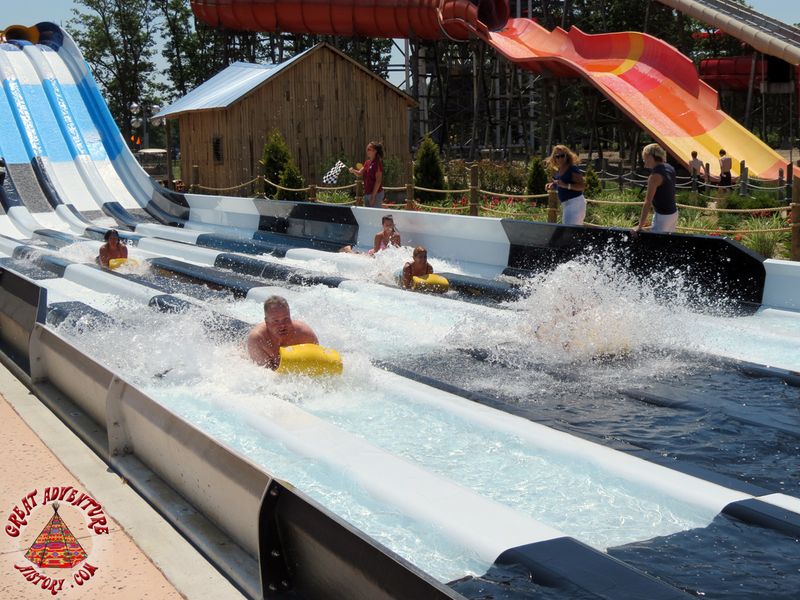 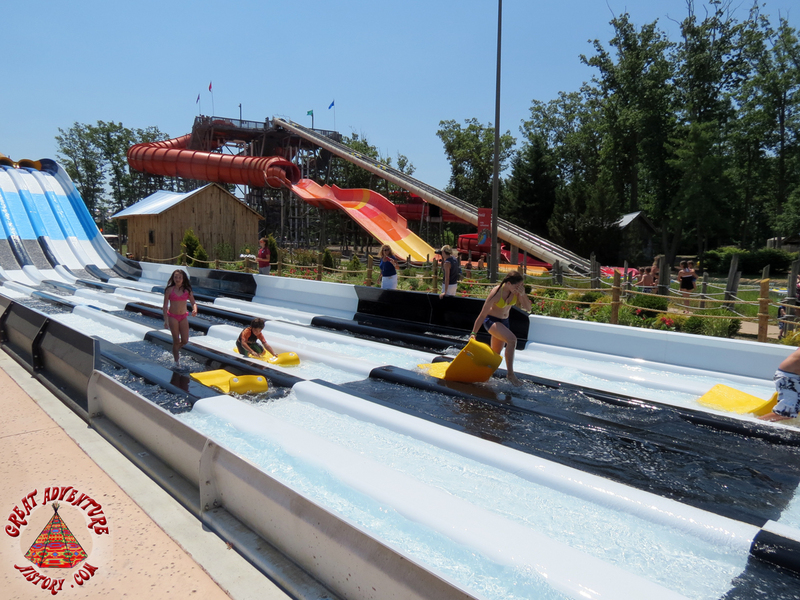 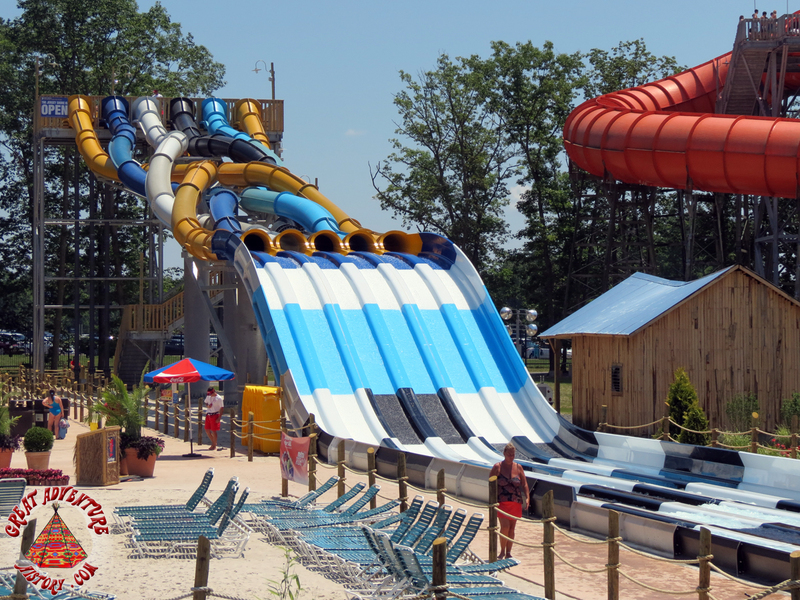 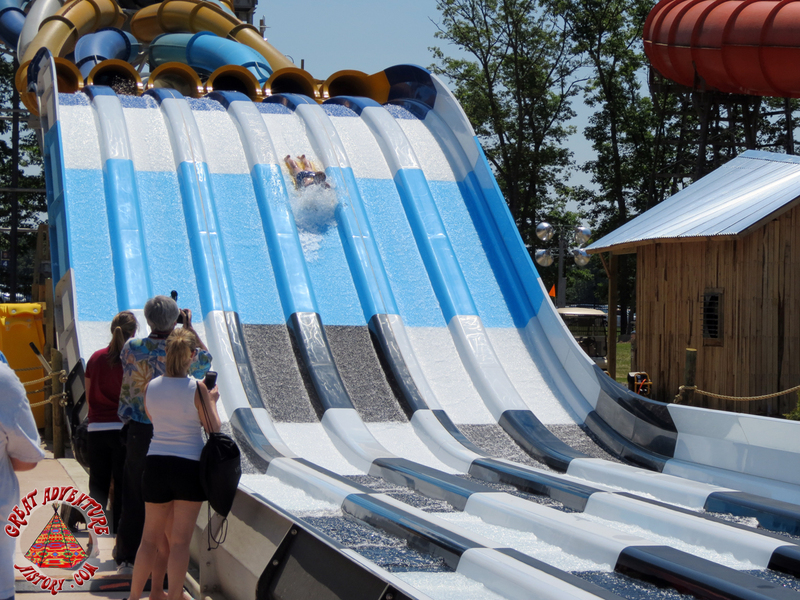 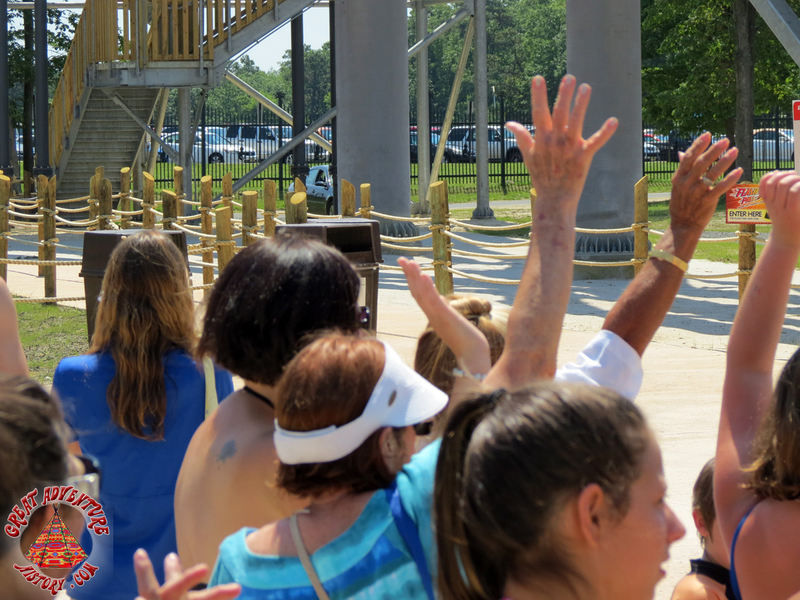 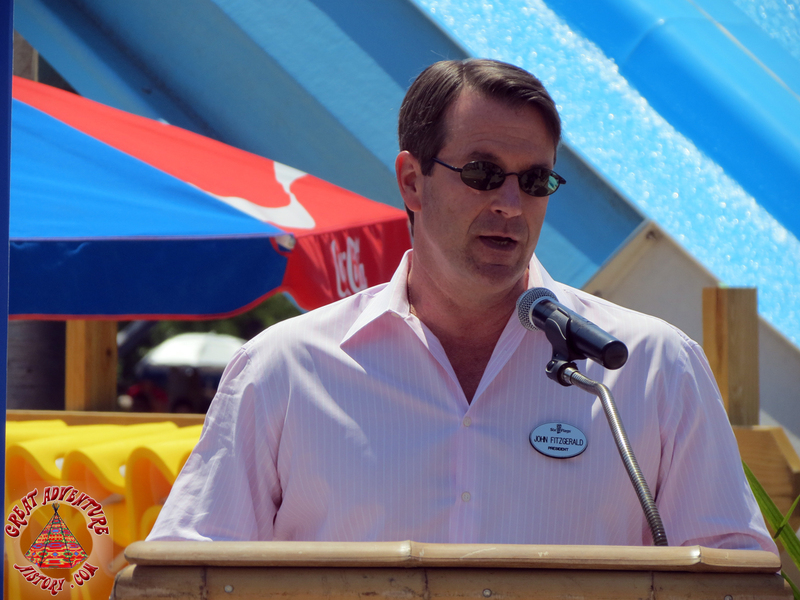 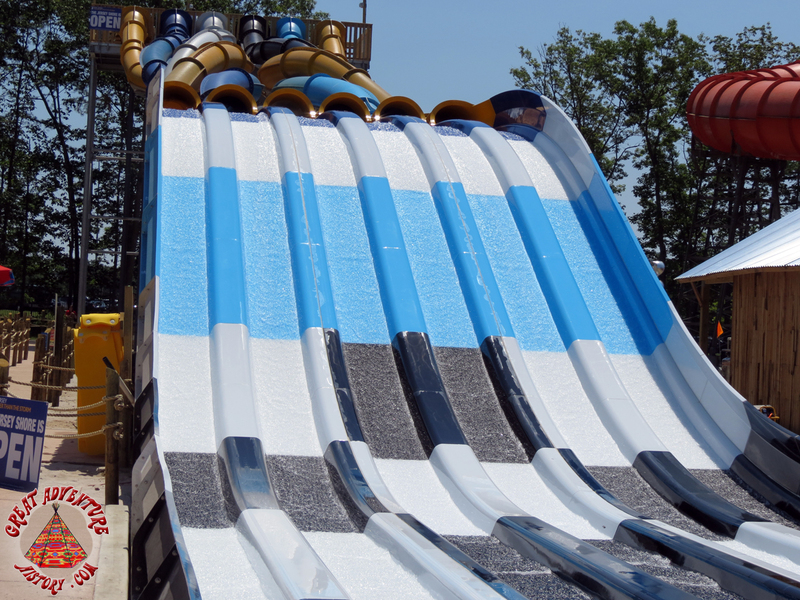 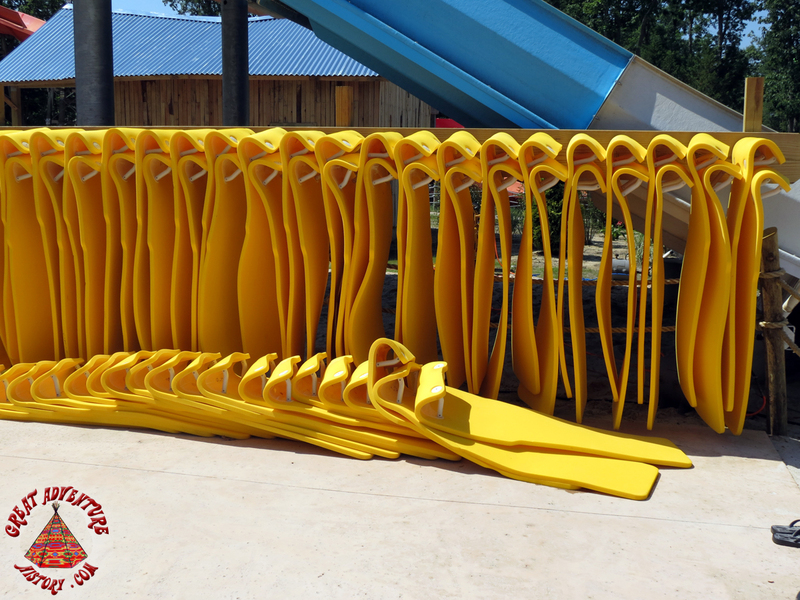 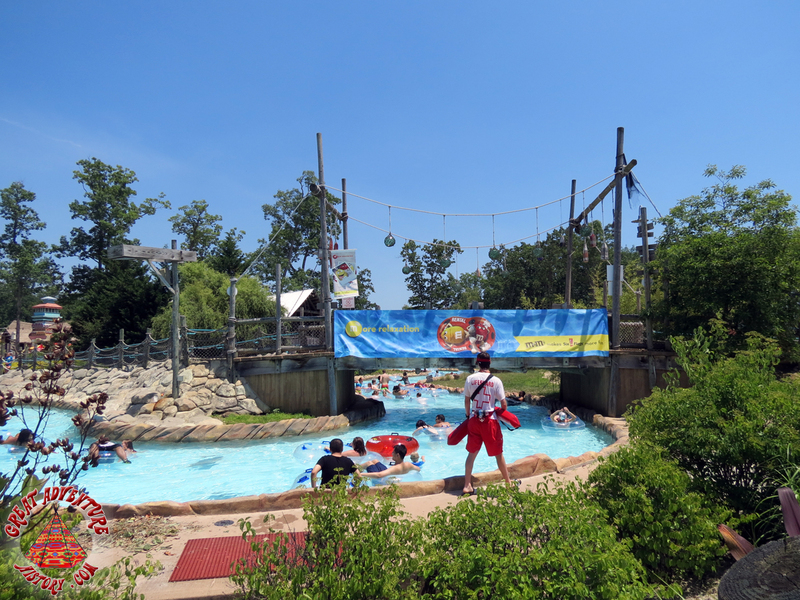 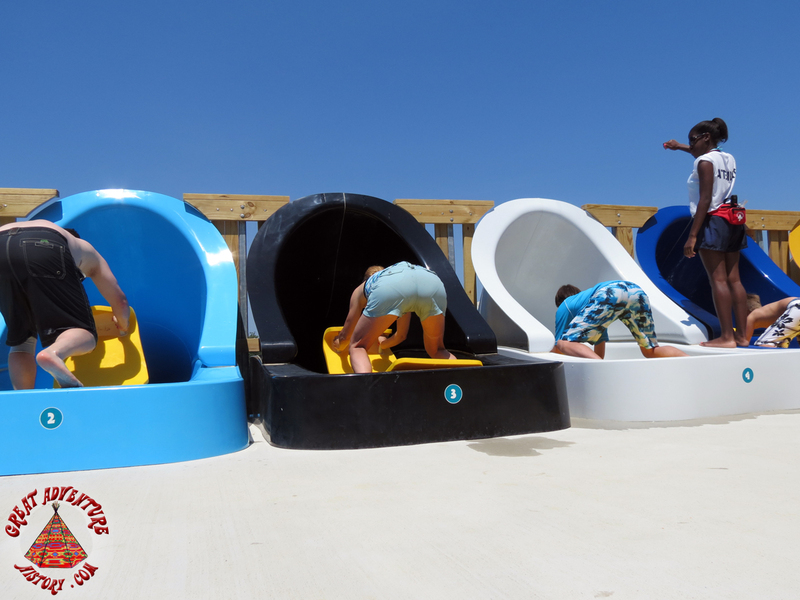 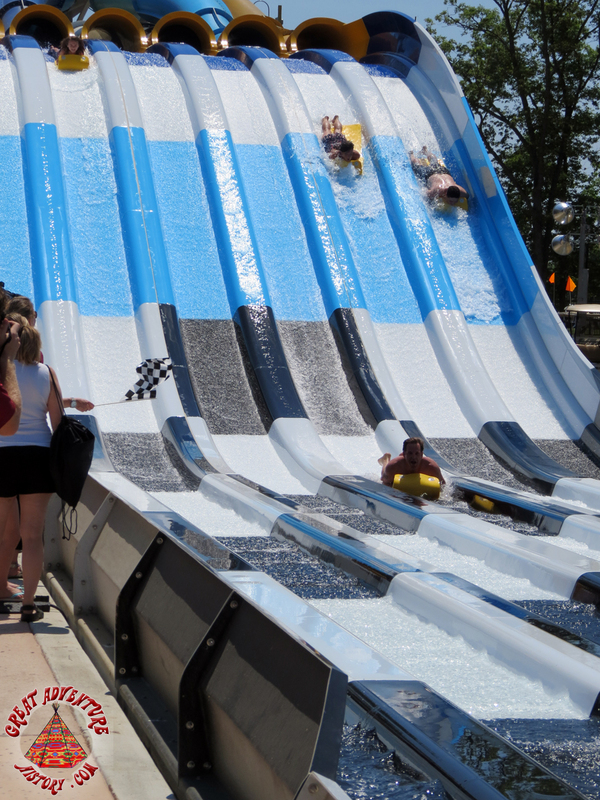 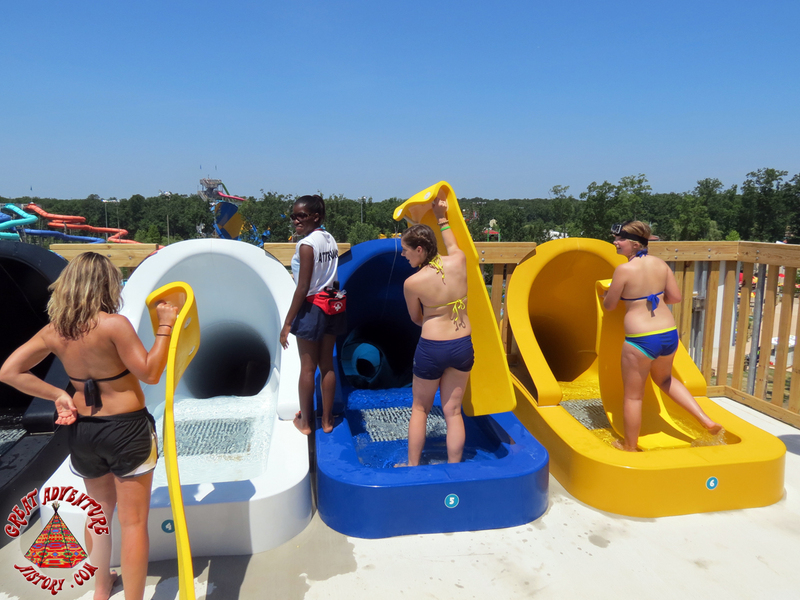 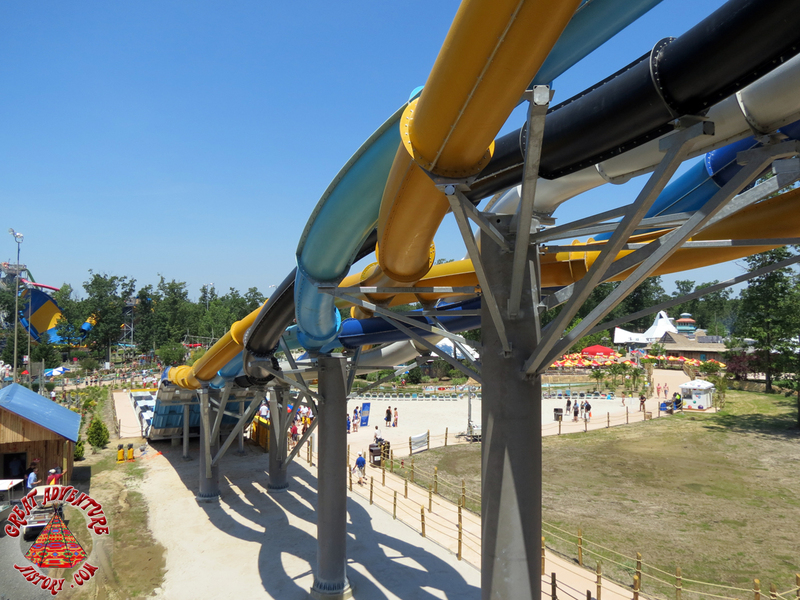 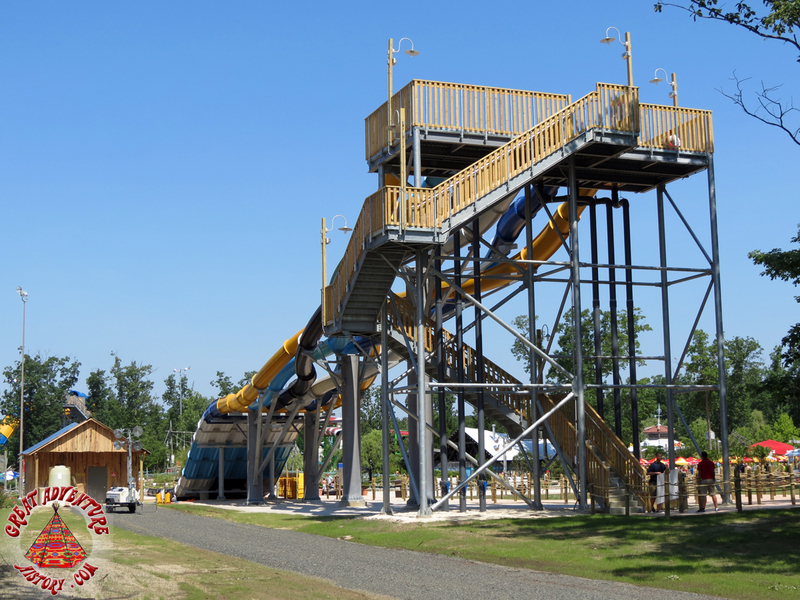 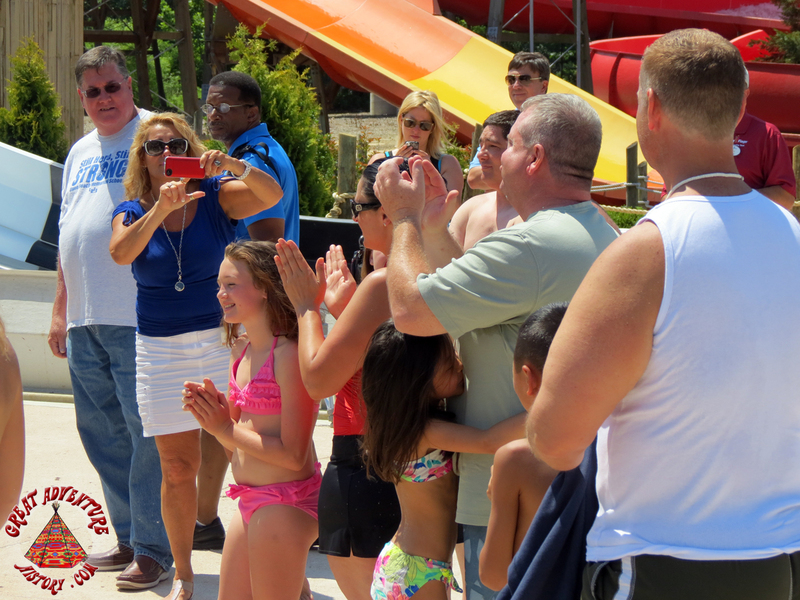 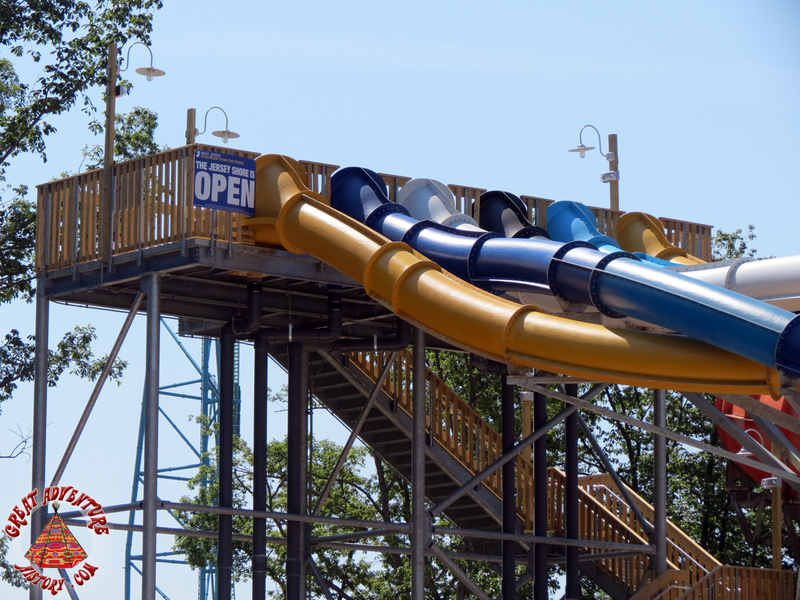 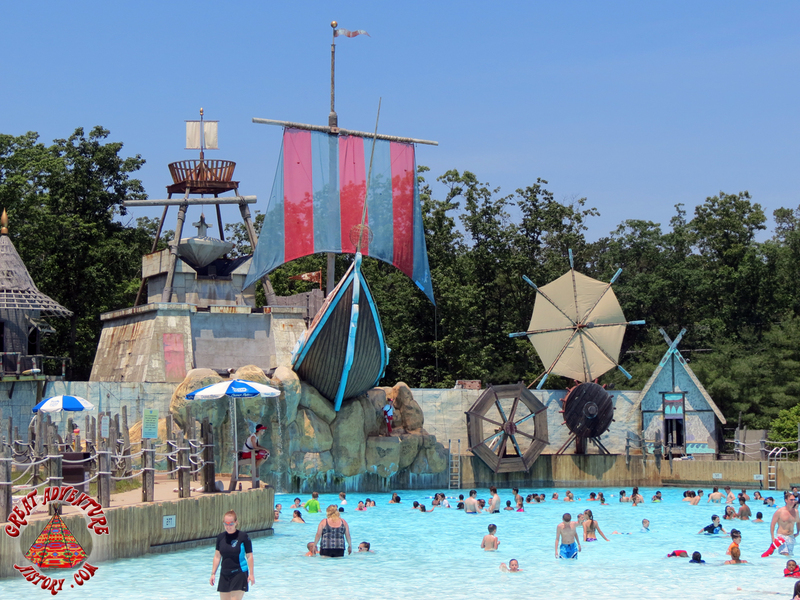 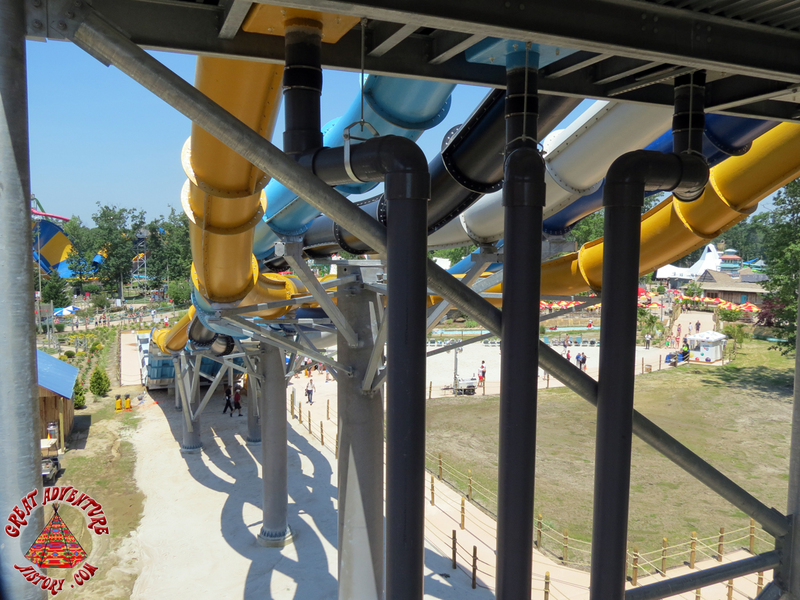 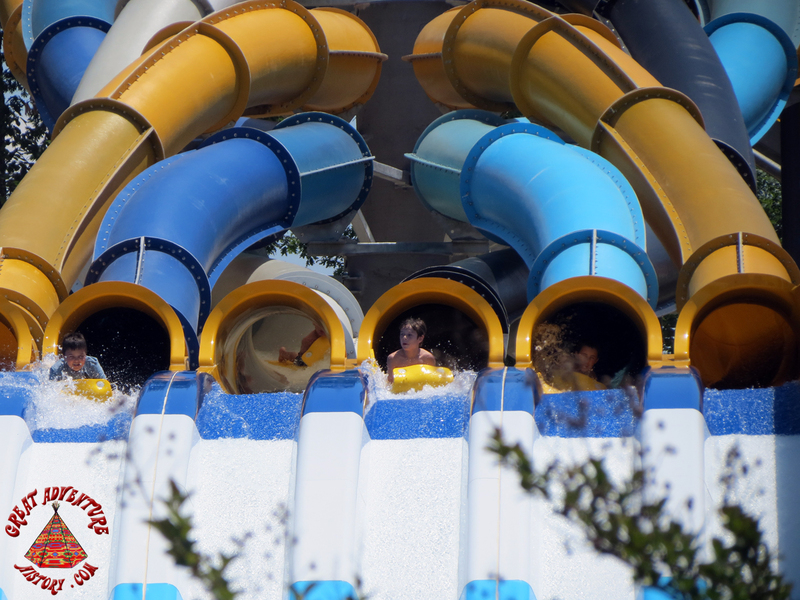 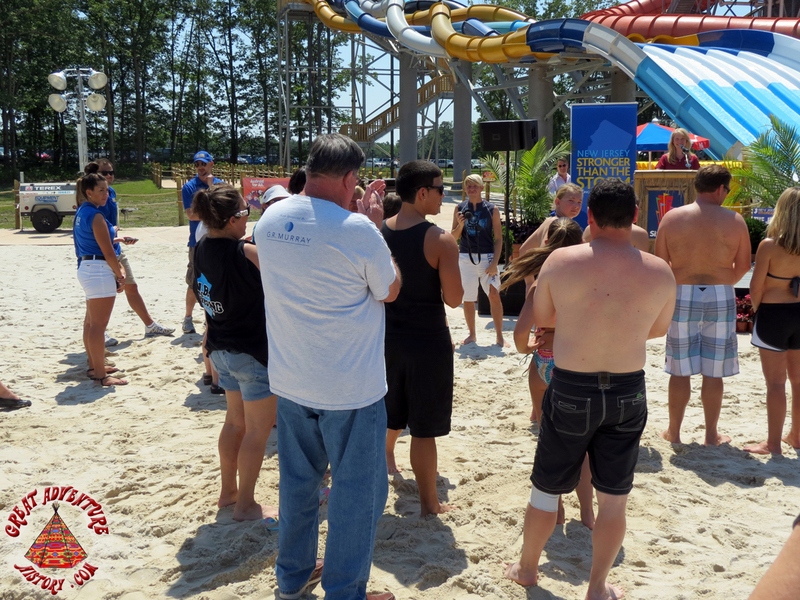 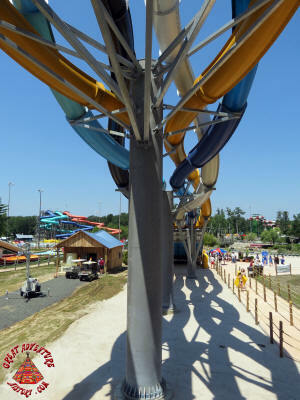 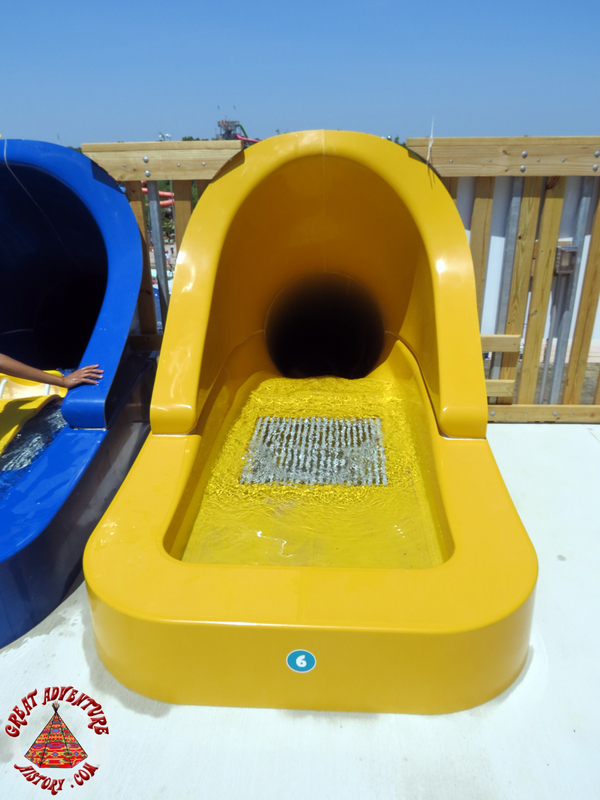 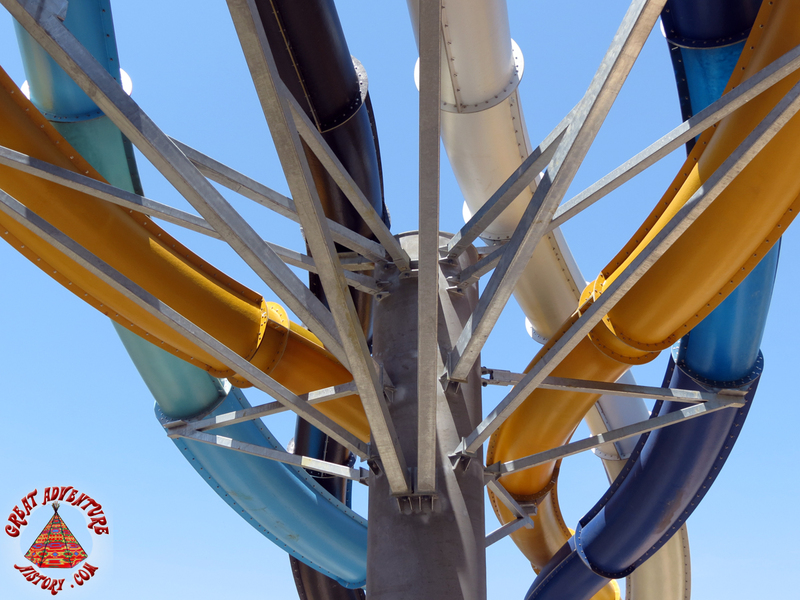 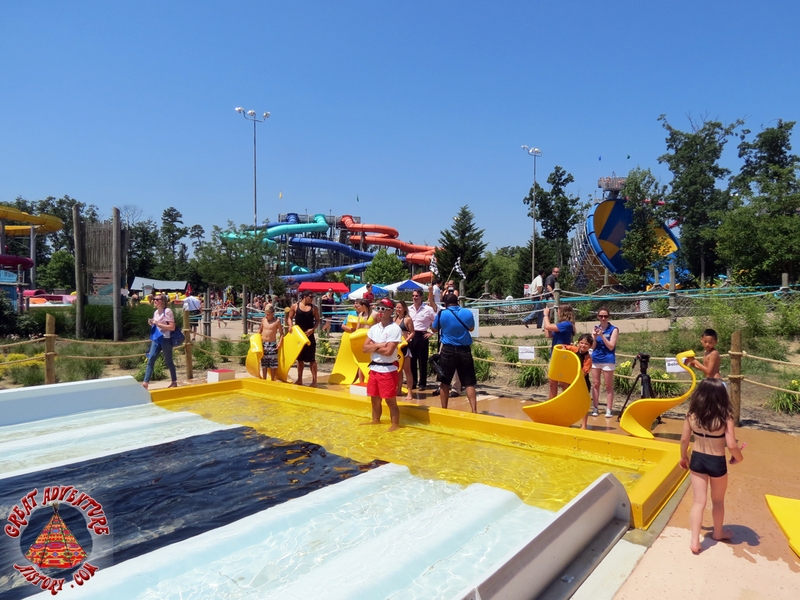 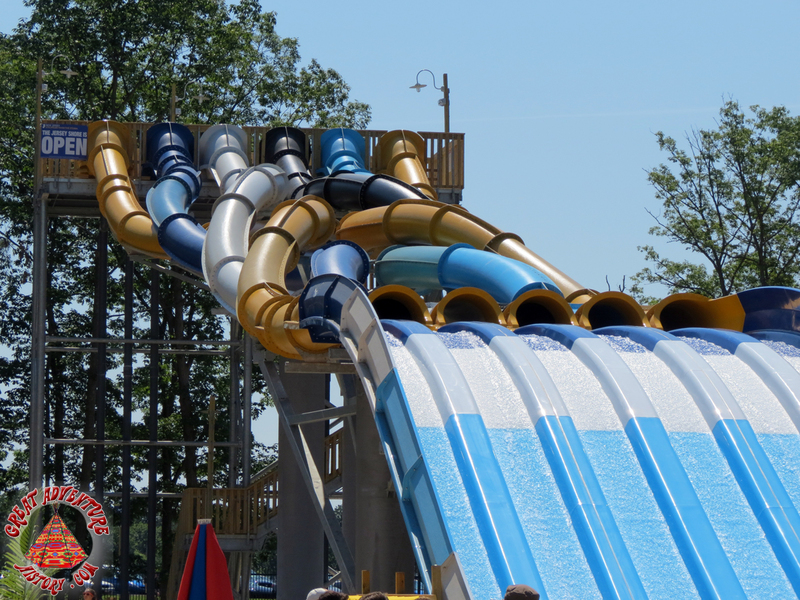 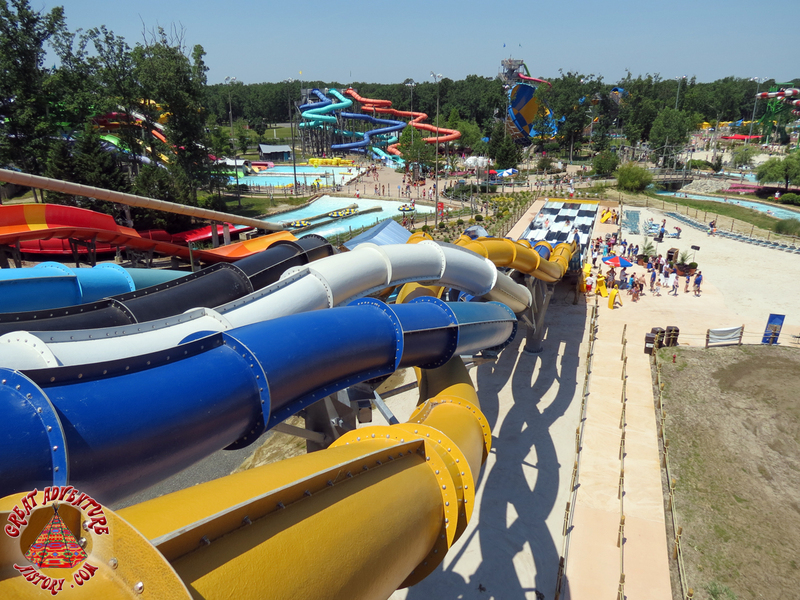 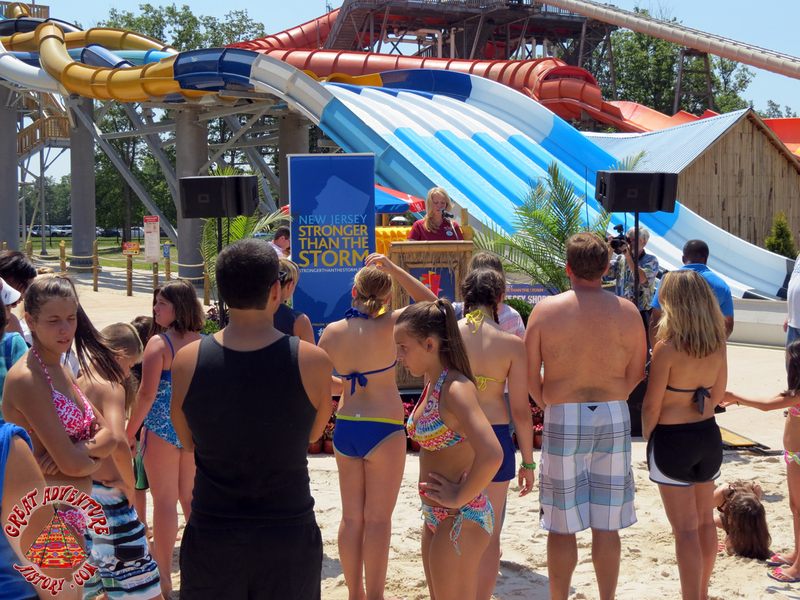 It was the first day of summer, the grand opening of the Big Wave Racer water slide, and Hurricane Harbor's first Dive-In Movie event! 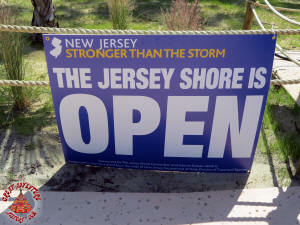 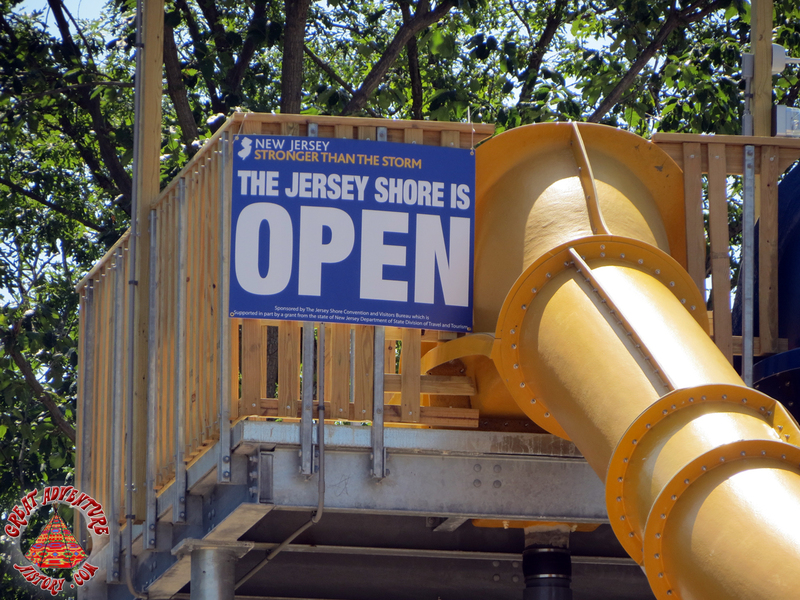 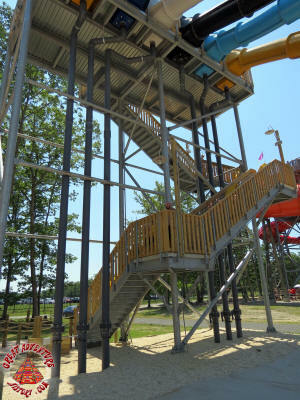 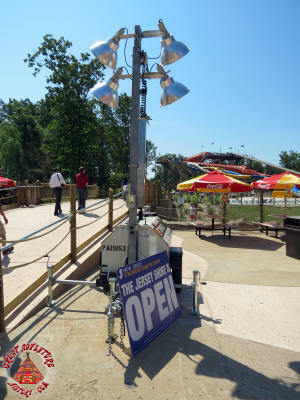 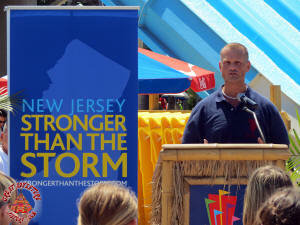 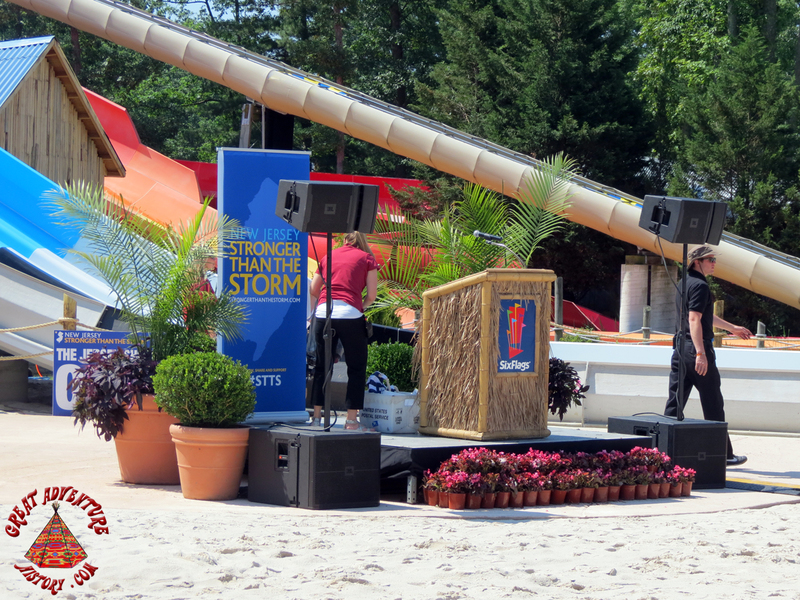 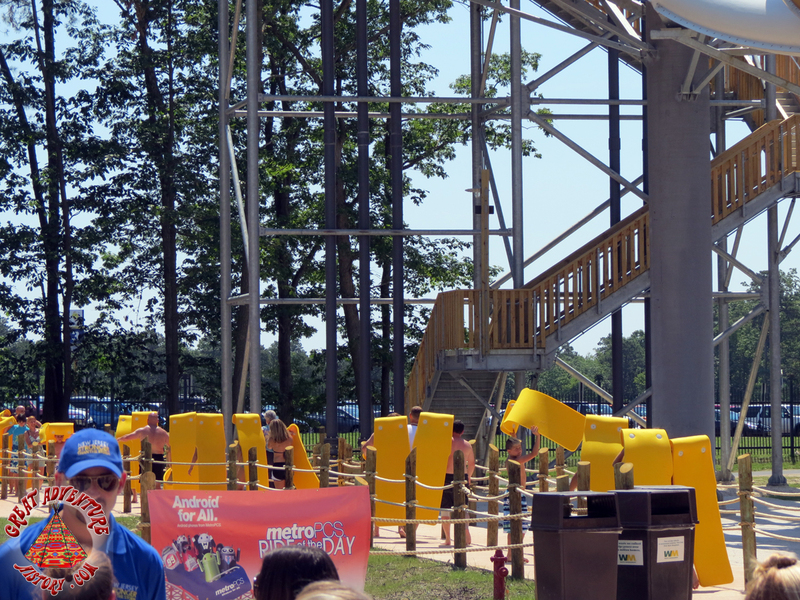 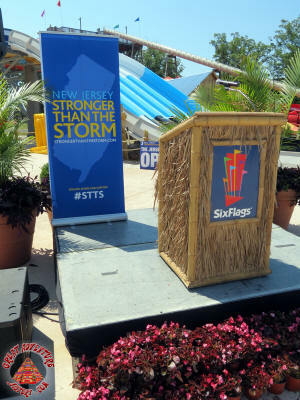 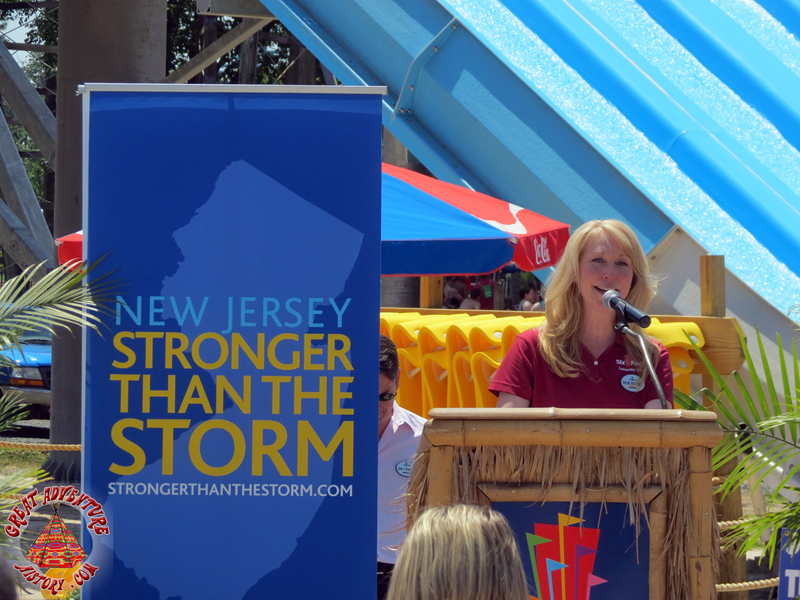 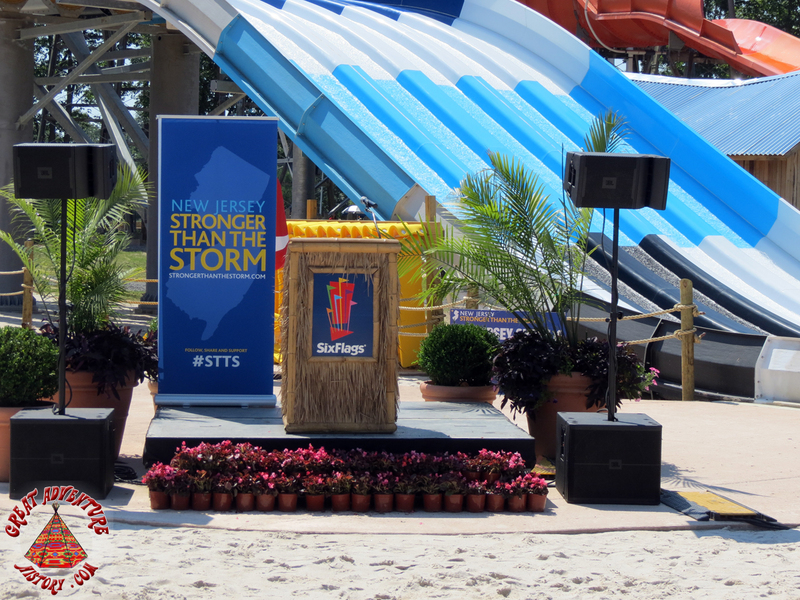 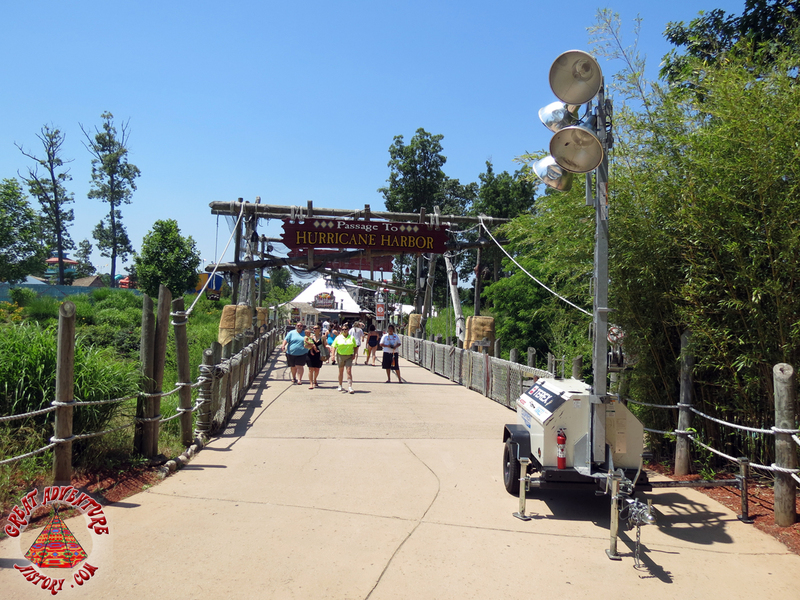 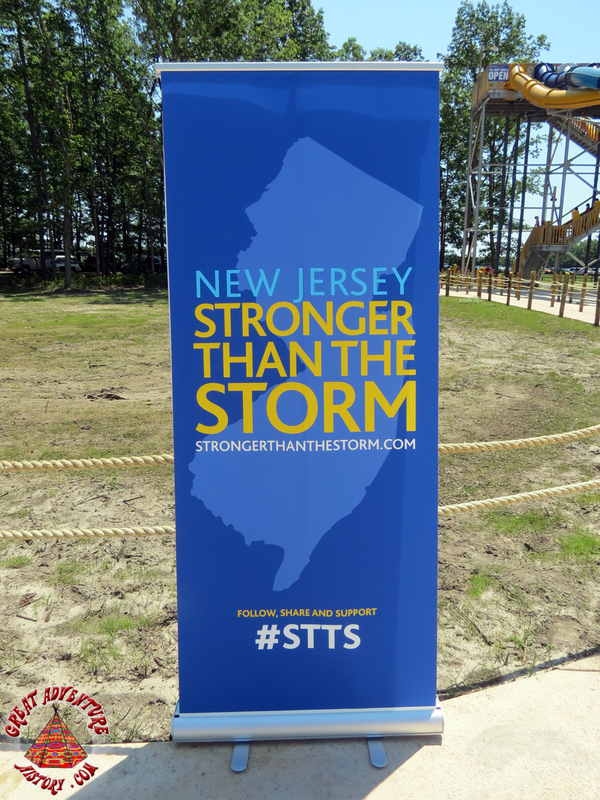 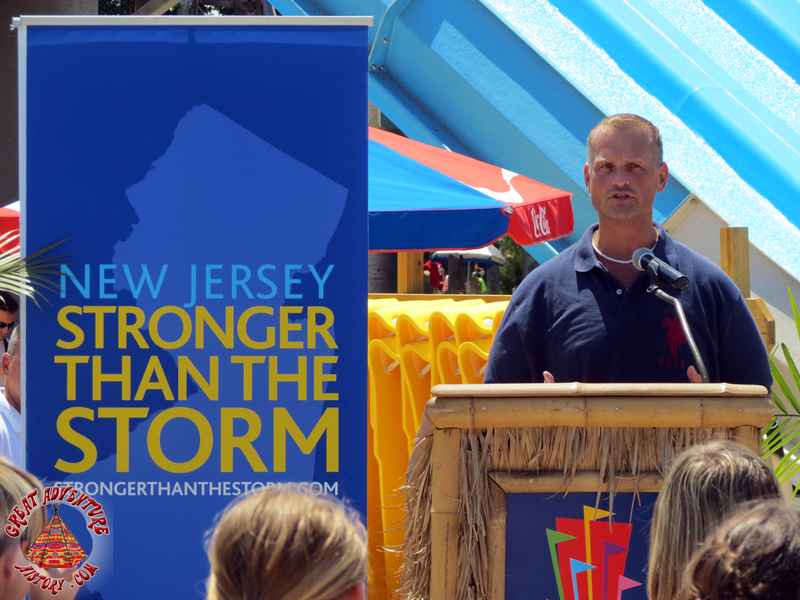 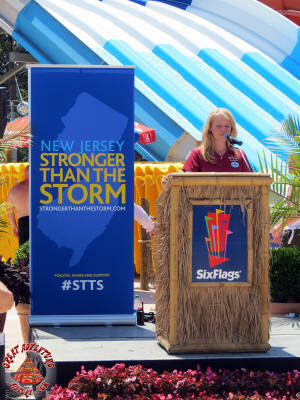 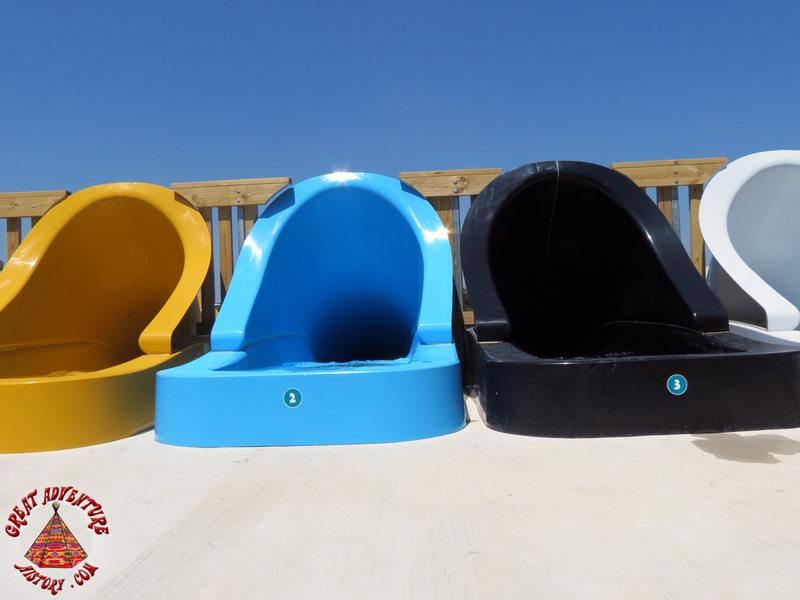 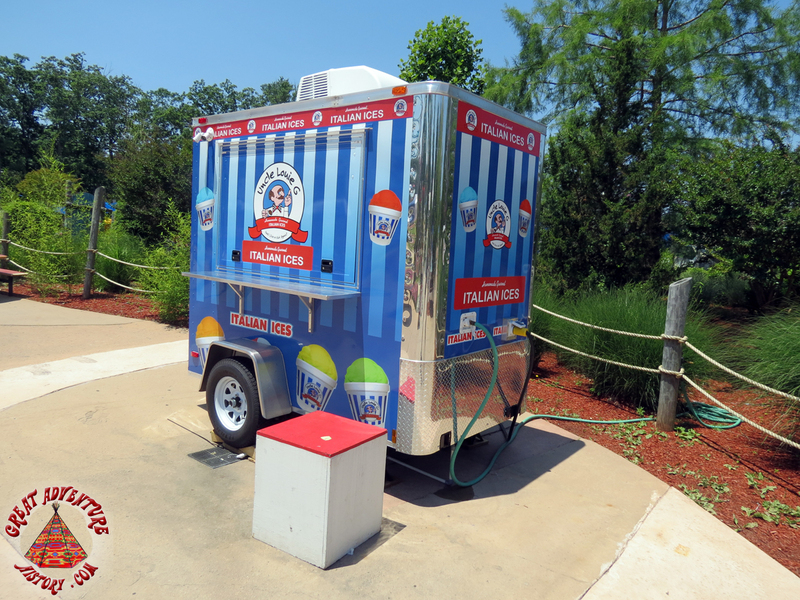 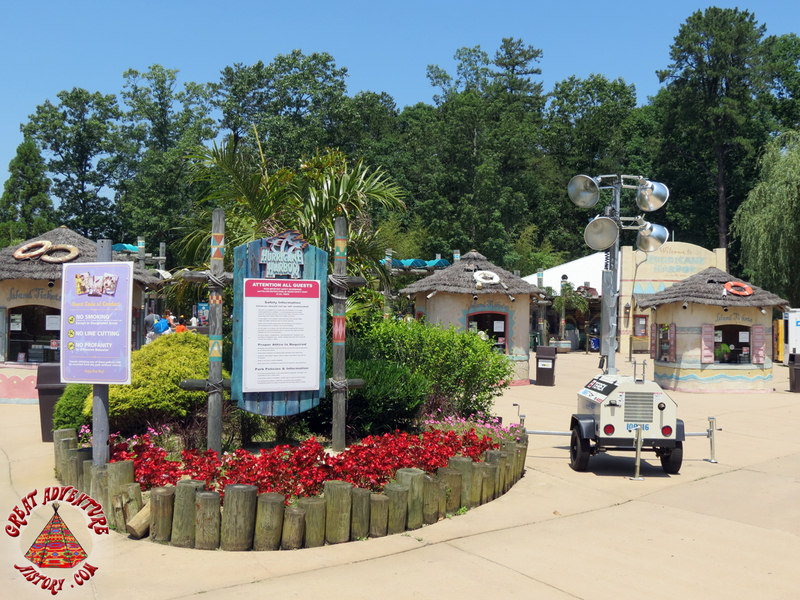 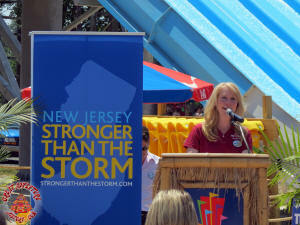 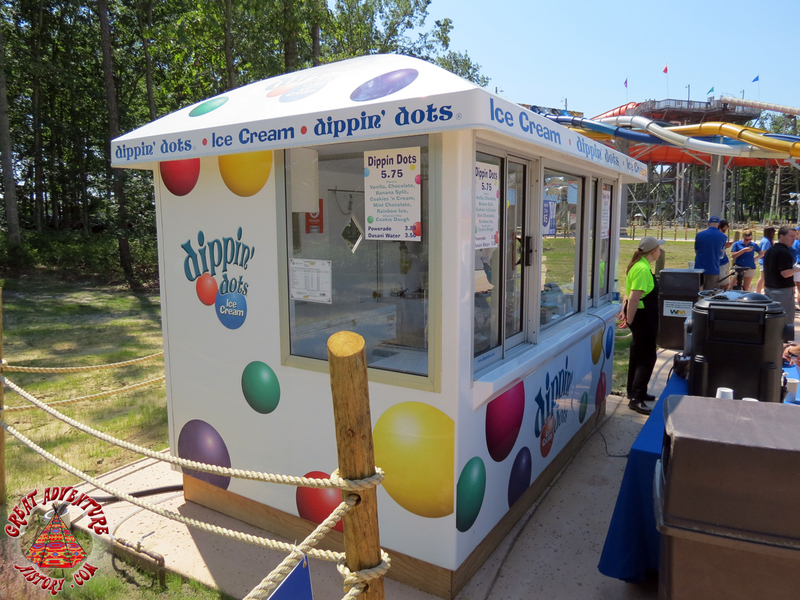 In addition to thousands of dollars in donations, Six Flags Great Adventure helped raise money through today's ticket sales to help promote the businesses of the Jersey shore and get the word out that New Jersey is "Stronger Than The Storm". 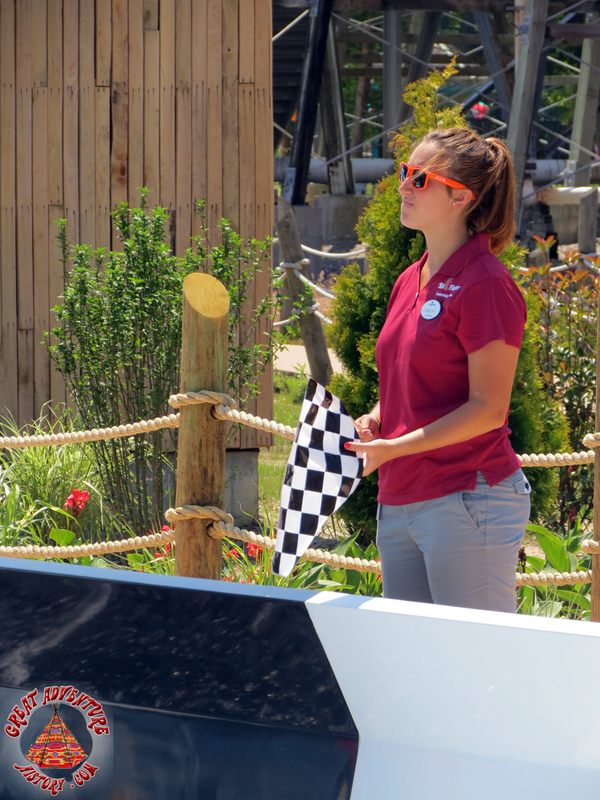 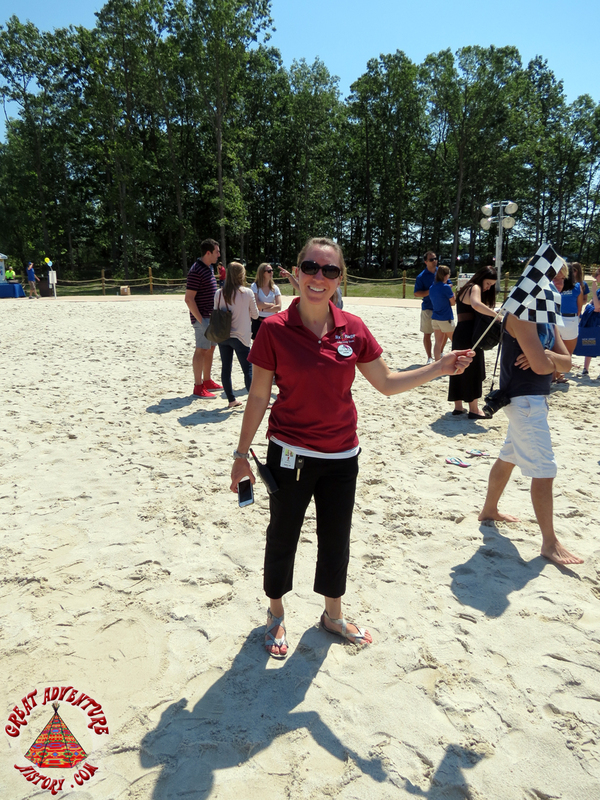 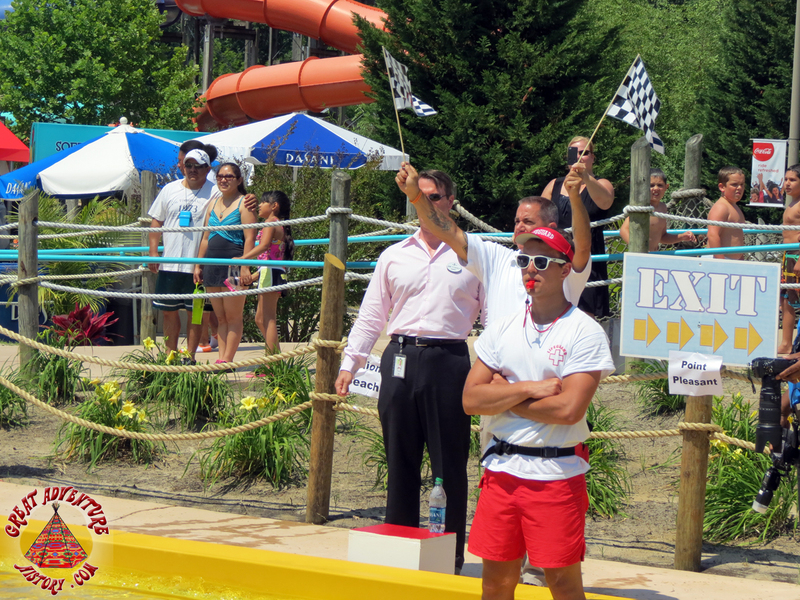 Kaitlyn, with checkered flag in hand, gets ready for her assignment at the finish line. 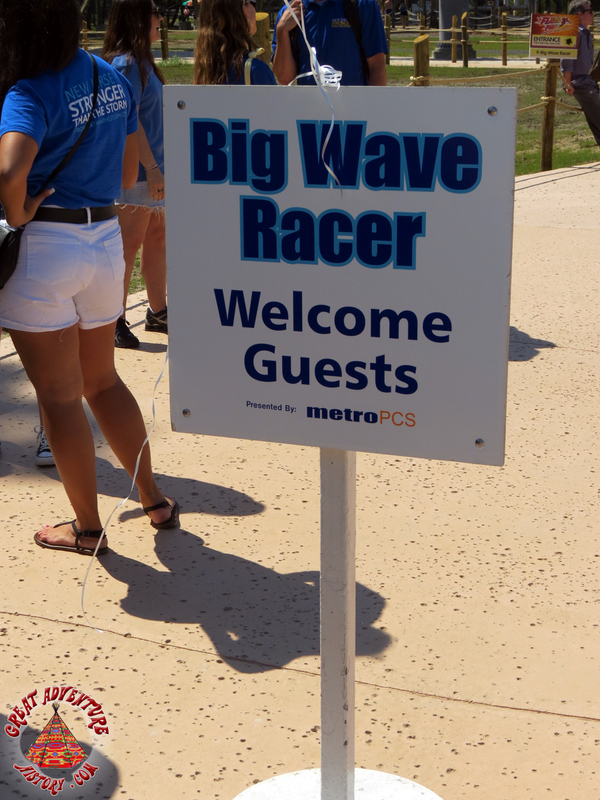 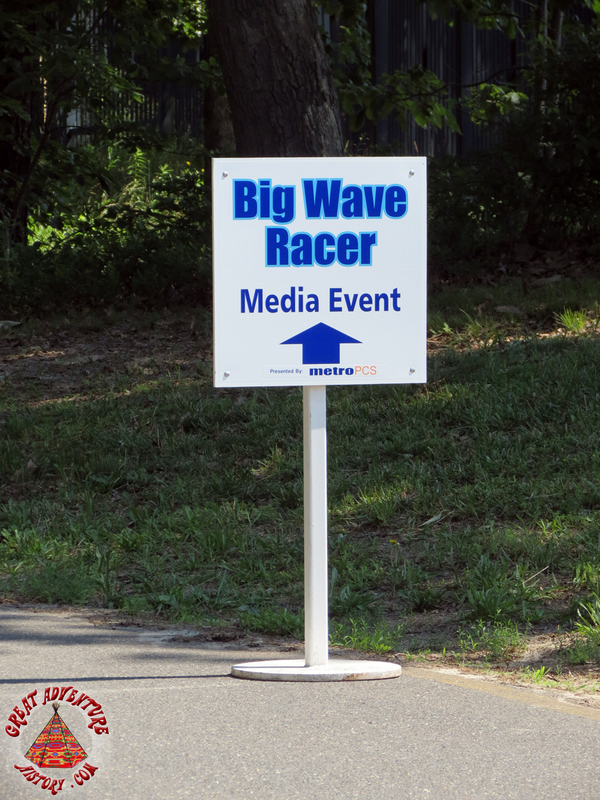 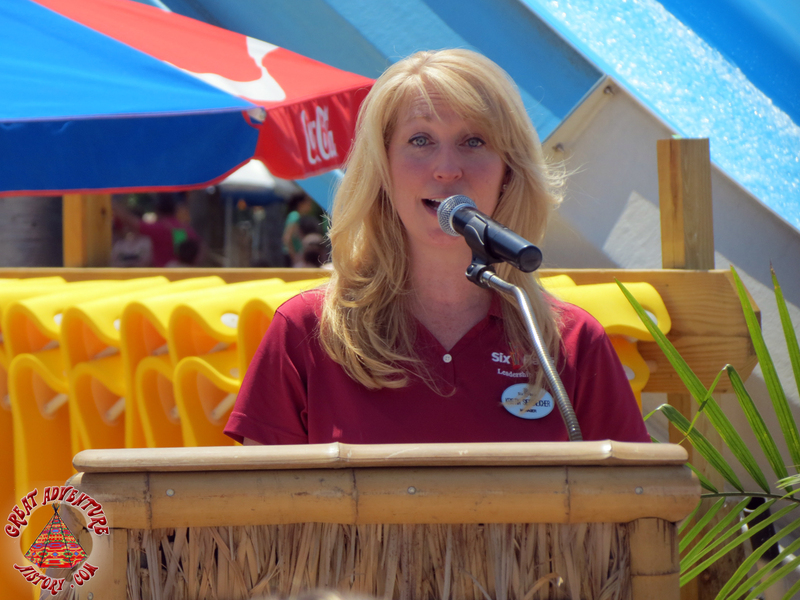 Kristin Siebeneicher welcomes everyone to the Big Wave Racer event. 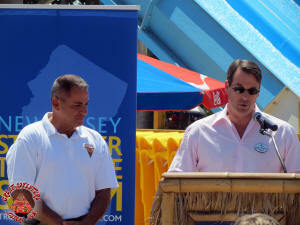 Park President John Fitzgerald and Jackson Mayor Michael Reina were next to take the stage. 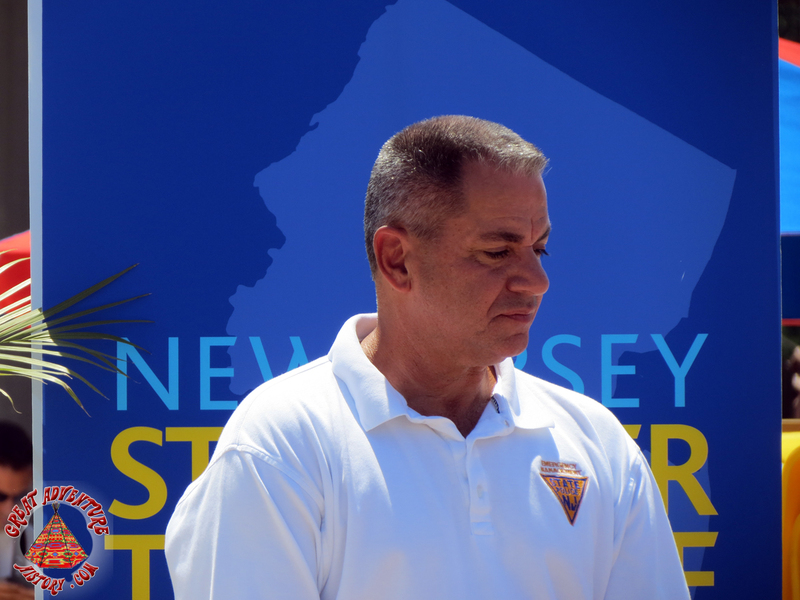 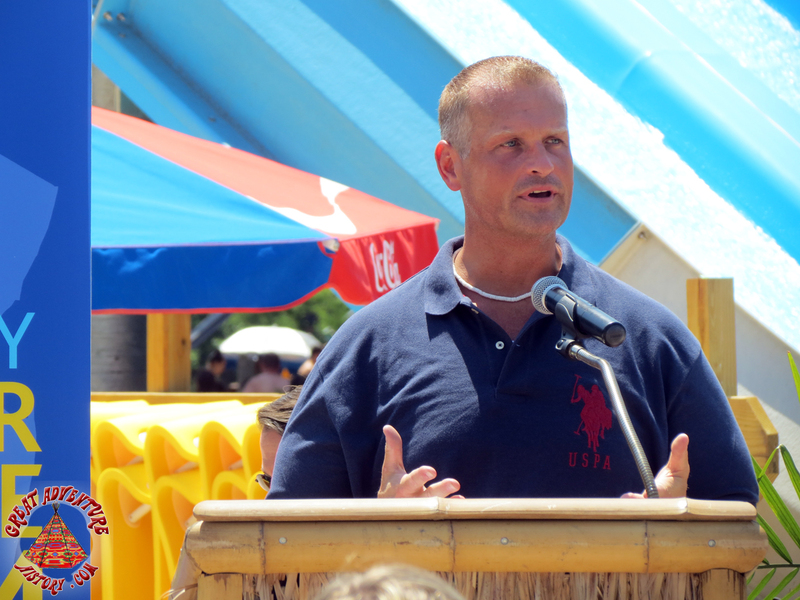 Five shore towns, including Keansburg, Lavallette, Point Pleasant, Sea Bright, and Union Beach, had representatives and local participants face-off in a relay rally. Each group received a $1000 donation from the park and the winning team, Point Pleasant, received an additional $1000. 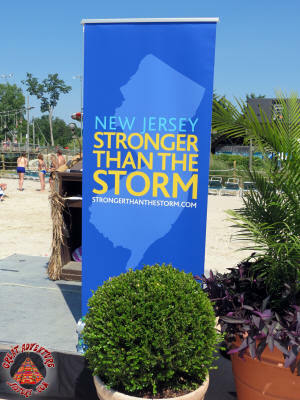 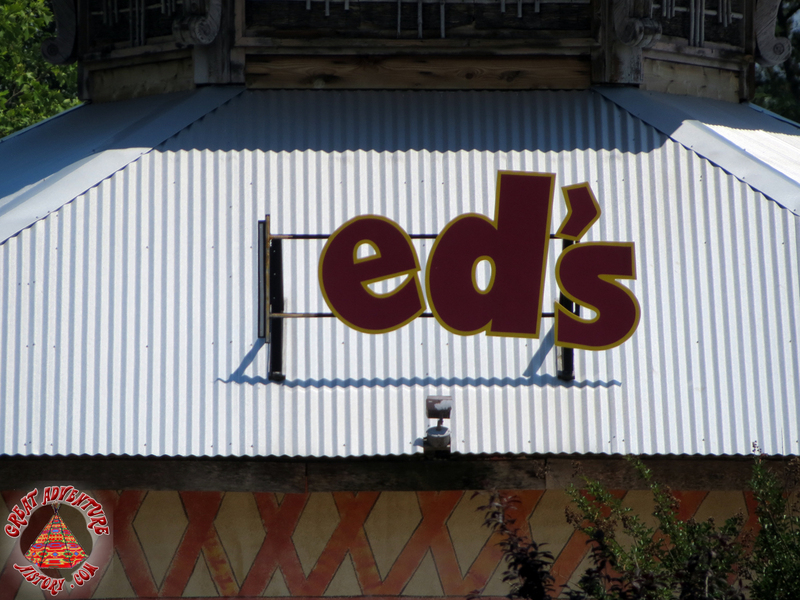 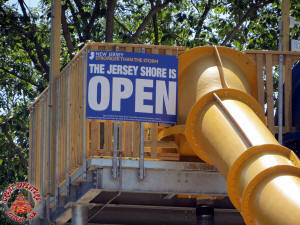 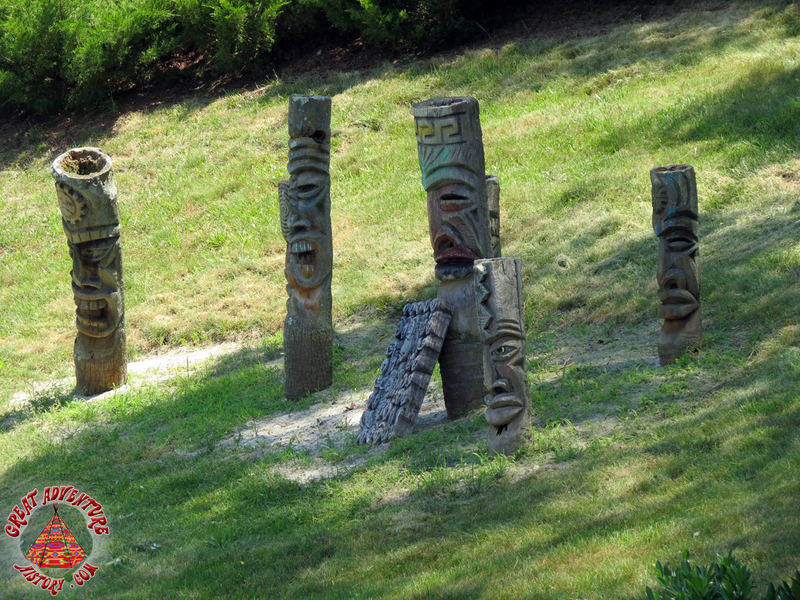 A sixth team from Belmar was scheduled to attend but unfortunately did not make it to the event. 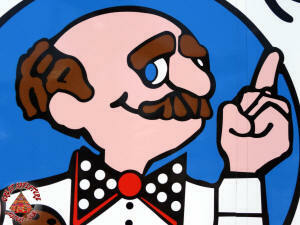 The mayor of Jackson signaled the start of the races. 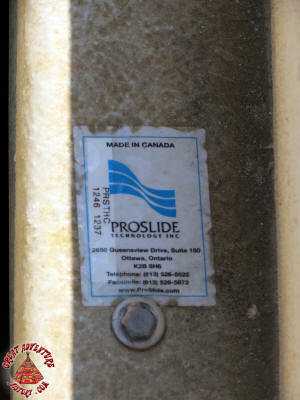 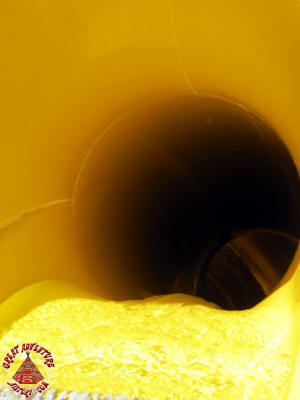 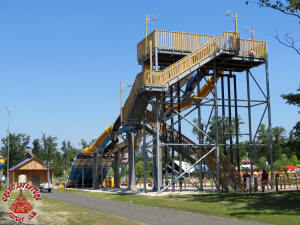 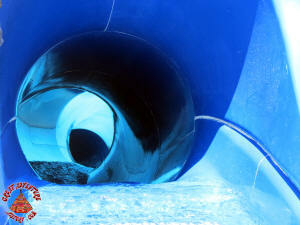 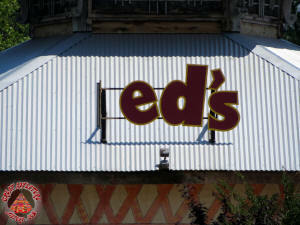 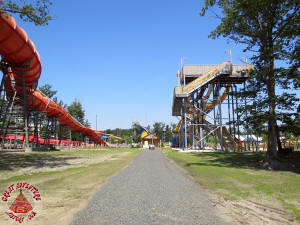 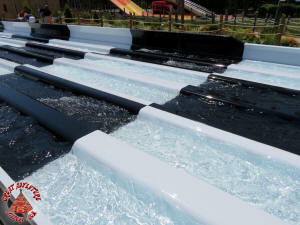 far side of the slides. 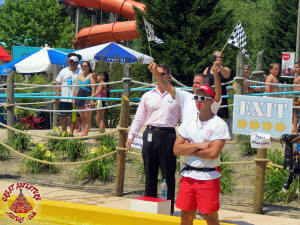 In the end, Point Pleasant was the undisputed winner having finished the majority of the races in first place. 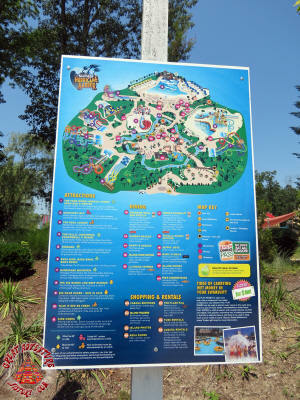 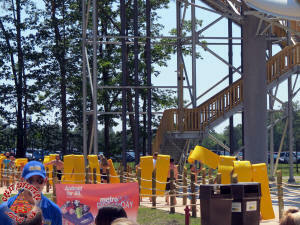 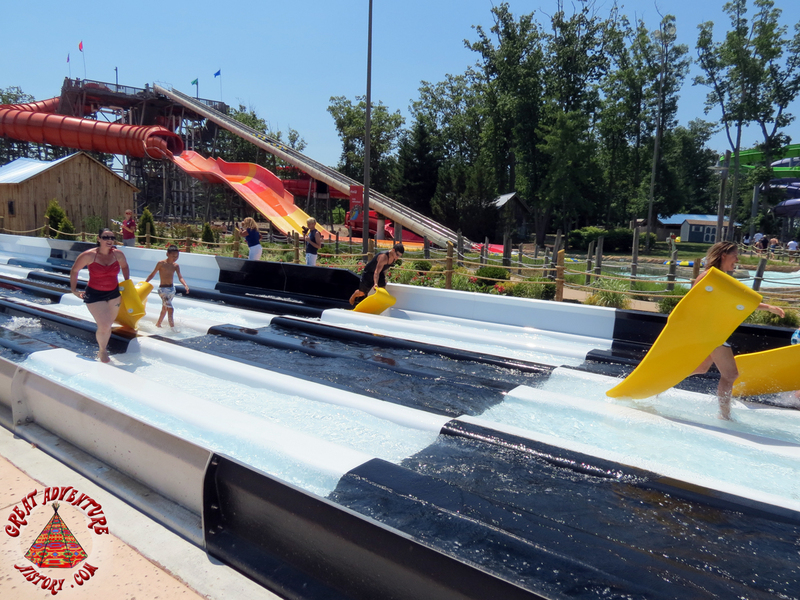 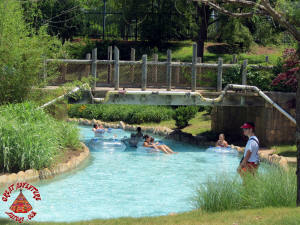 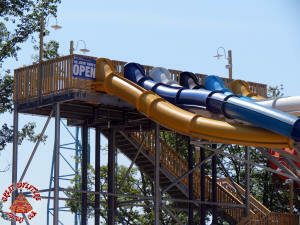 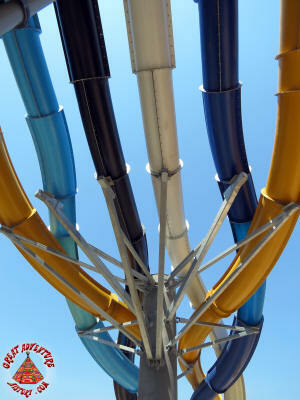 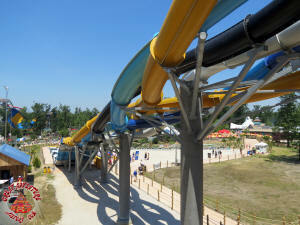 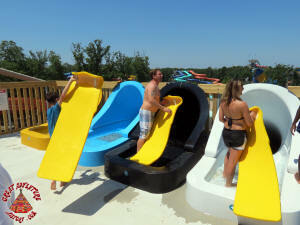 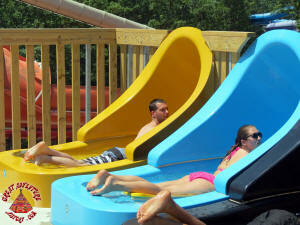 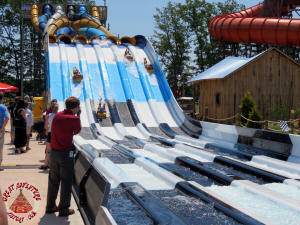 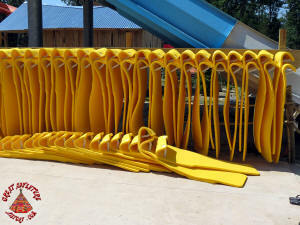 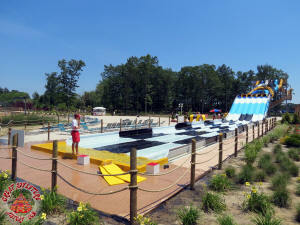 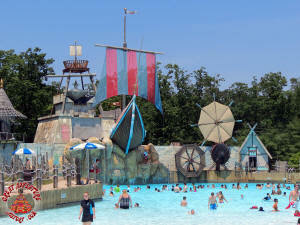 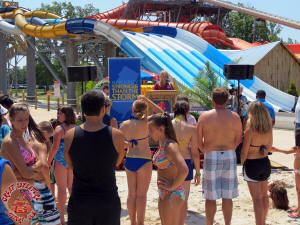 In addition to the official opening of Big Wave Racer, tonight was also Hurricane Harbor's first Dive-In Movie event. 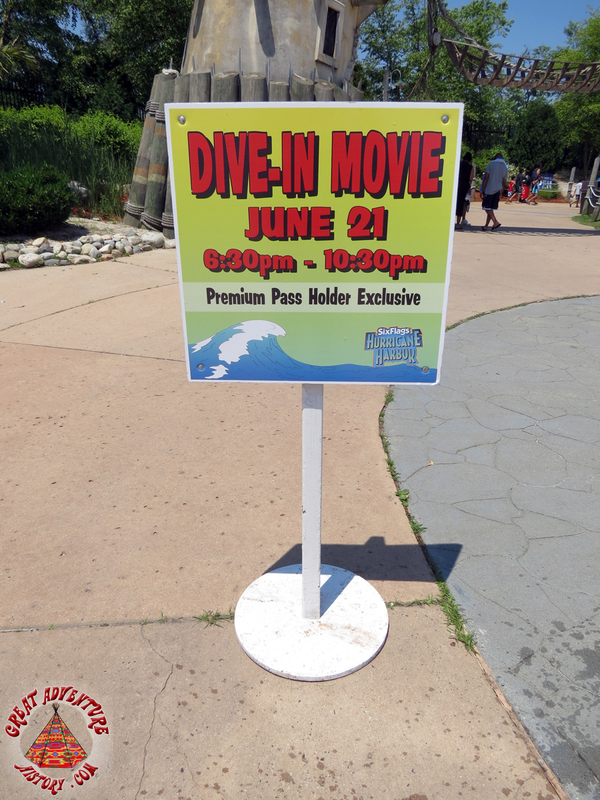 Premium season pass holders were invited to enjoy a selection of water slides and enjoy an evening showing of a family movie. 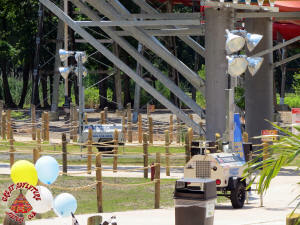 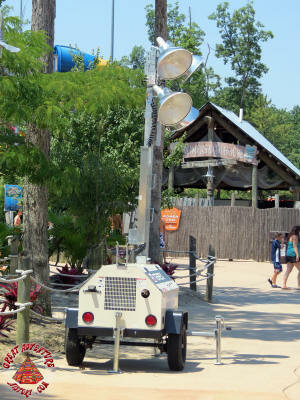 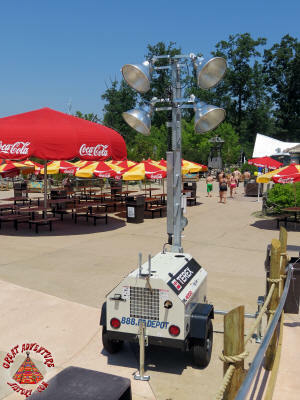 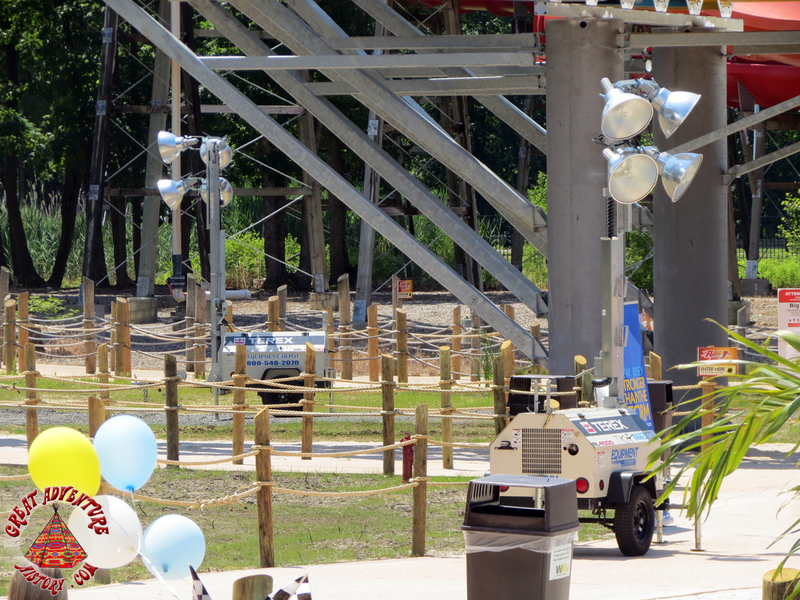 Special lights were brought in for the night time event. 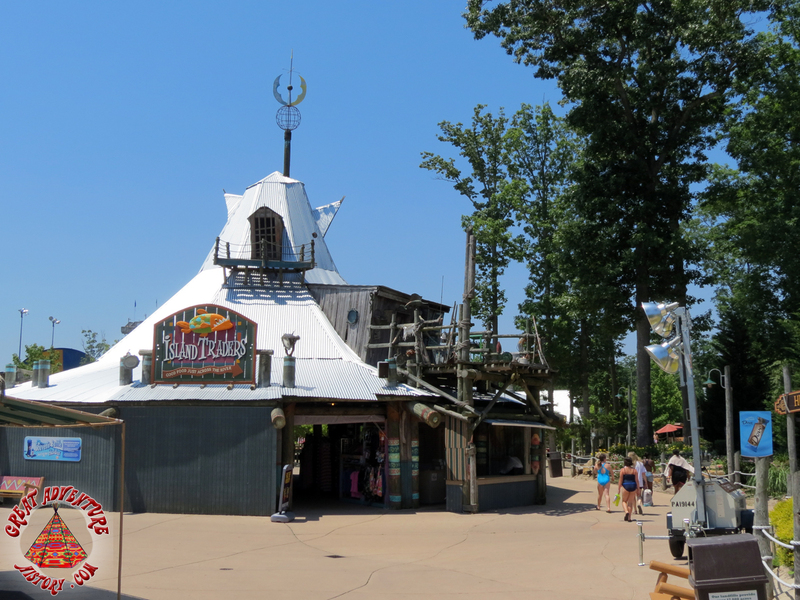 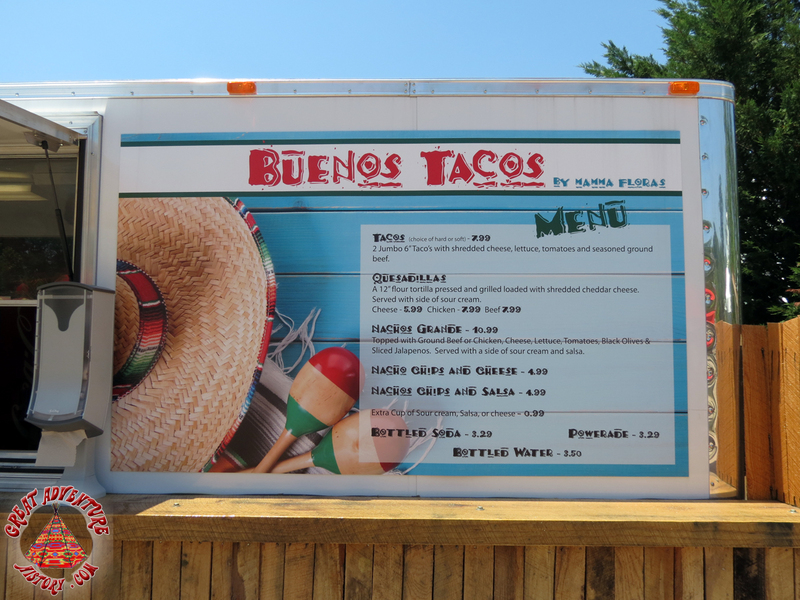 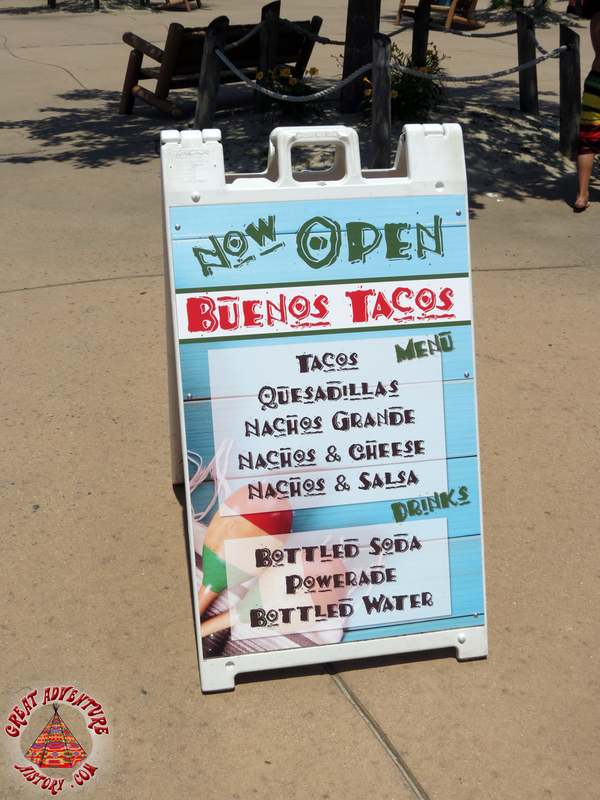 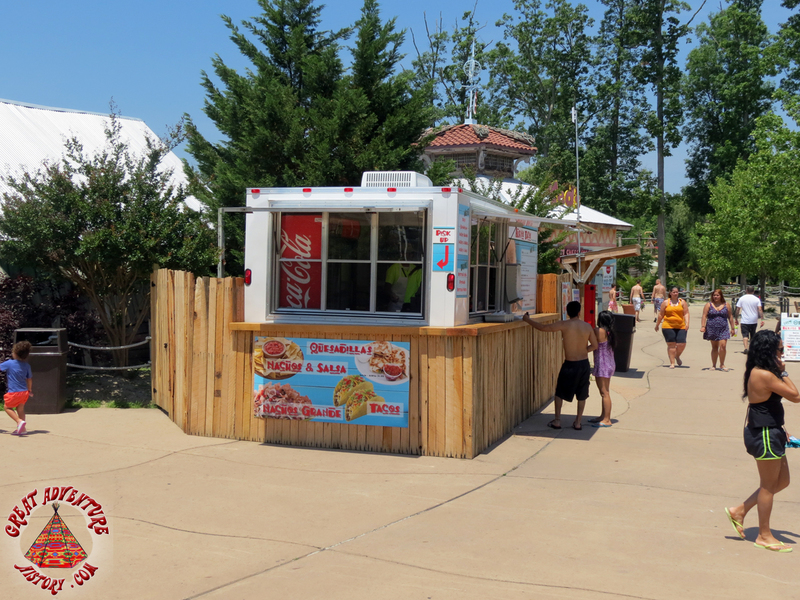 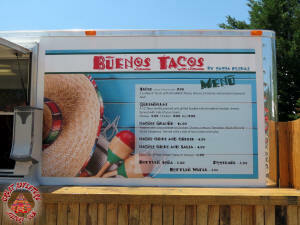 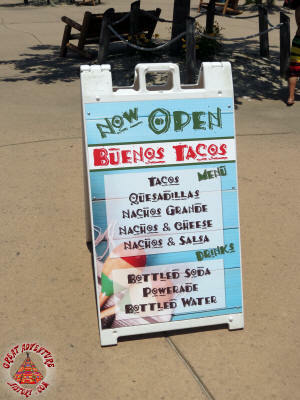 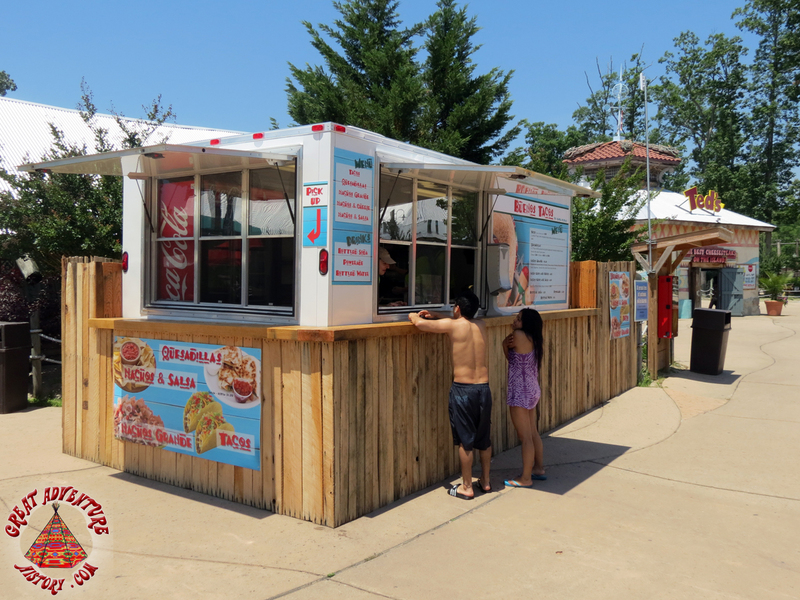 Buenos Tacos is a new food stand in the park.